Our creative team of designers at our Innovation Centre and our Oxygem recently helped Myles to become more independent. Myles’ mum Vickie tells us more – and take a look at the great video at the end! We are a family of 4 – me, my husband Neil, Noah who is 6 and Myles who is 2 1/2. Myles was born a seemingly healthy full term baby boy. But he struggled to thrive and was always catching viruses, we seemed to be at the doctors every week. He developed pneumonia at the age of 5 months and was hospitalised. We were sent home with medication but over the next few weeks he deteriorated and ended up being taken into intensive care where he required ventilation. It was thought that Myles would be able to be weaned off oxygen as he had suspected broncholitis. After weeks in hospital trying to wean him it was obvious something else was going on with his lungs. For the rest of the year he was in and out of hospital having investigations and surgery. They decided to do a gastrostemy for additional nutrition as growth was a vital part of his care. After a lung biopsy and genetic screen he was diagnosed with Surfactant Protein Deficiency Type C. This is a condition which results in the lack of tension in the alveolar sack minimising the surface area for gas exchange. Myles has been dependent on oxygen ever since meaning he always has to have an adult with him to carry the oxygen cylinder. Myles has done amazingly well hitting his milestones albeit a little delayed. He has started going to nursery just a few hours a week so I wanted to try and find something that would give him a little more independence. I spoke to our care teams but there didn’t seem to be anything available through the NHS or privately. I even started to look at portable concentrators as these are much lighter but unfortunately these work on a pulse flow rate. A child’s breath intake is not strong enough to trigger the release of oxygen so these are only suitable for adults. Through searching the internet I came across Cerebra and your Innovation Centre. 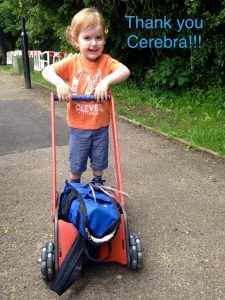 The Oxygem looked perfect for Myles as he’s strong enough to push a trolley and it would enable him to have a level of independence. We were so overwhelmed he was accepted to receive one of the prototypes. He took to it straight away and now enjoys walking round the park with it and walking on the school run. Myles’ condition means that as he grows he will hopefully be able to have stints off the oxygen. But it’s during levels of activity that he really needs more. The Oxygem enables him to move around with the cylinder when he needs it most. He is due to start school September 2019 and I think the Oxygem will really allow him to integrate with his peers. The fact that the handles can be changed for longer ones as he grows is brilliant. Can our Innovation Centre help your family? Don’t hesitate to get in touch for a chat.